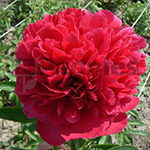 Delaware Chief is a beautiful dark red coloured, full double bomb Peony. It opens in a deep ruby red and grows to a large globular form in the very early season. Medium tall, vigorous, makes a wide bush and stands well. The leaves are dark green and the appearance holds reasonably well as the summer progresses. Similar to its parent, the Officinalis cultivar ‘Rubra Plena’, but bigger in all its parts. Triploid.